While Emily Dickinson is one of the most widely studied American poets, some dimensions of her life and work are largely under-appreciated. This book provides the wider context necessary for a more complete understanding of Dickinson, presenting Dickinson's life and times as well as discussion of her poetry and letters. 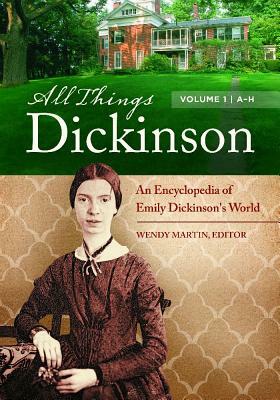 Prolific author and Dickinson expert Wendy Martin and 59 contributors address the relationship between Emily Dickinson's life and work and the larger world in which she lived. Examination of topics such as the history of Amherst, MA, and the Dickinson family's place in it; and the cultural, financial, political, legal, and religious practices of the day illuminate important dimensions of Dickinson's experiences and world for students, scholars, and general readers of this iconic poet's work. Wendy Martin is professor of American literature and American studies and the director of the Tufts Poetry Awards Program at Claremont Graduate University (CGU).